“Meh, they’re weak like restaurant cocktails,” I shrugged. “Well, come on now. Let’s be fair, they ARE restaurant cocktails,” replied Spago Beverly Hills Wine Director/Master Sommelier Chris Miller. Apparently my drinking companion, Aaron of Savory Hunter, and I had inadvertently ordered the “girl drinks” of the redone Spago’s brand-new cocktail menu. But with both restaurant-friendly cocktails possessing Japanese 12-year whiskey, we thought we were safe from something “too light” for our hardened palates. And, yes, stop your grinnin’ and drop your linen, Wolfgang Puck’s Spago Beverly Hills now has a cocktail program. It’s new. Just like the restaurant’s dining room wine cellar, retractable patio roof and schnitzel-less small plates menu. The bar has been rehauled saying good-bye to that Tuscany brown and flavored vodkas and hello to urban grays, sleek lounge seating and booze shelves sporting an impressive array of quality spirits like Hudson Whiskey and Buffalo Trace Bourbon. The barware is comprised of jiggers and mixing glasses and the bartenders are perfecting their Japanese hard shake, with a slight roll and not so much a violent, ice-chipping back and forth. Aaron claimed the Adios Nonino, which was like a bitter, thinner Boulevardier, while I sipped on the Duke of Earl with its heady perfume of Earl Grey-infused gin. Now these were more like it. Where our initial cocktails, the Samurai Sword and Rolling Fog Over Mt. Fuji, possessed an unexpected daintiness perfect for starting off a meal, this second round, with its fuller flavors and potency, was more in the style of getting the party started. By the way, apologies for the horrid cellphone photos! 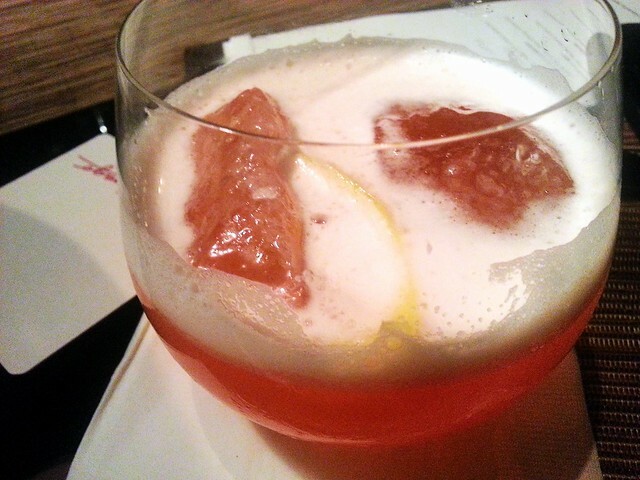 Duke of Earl: Earl Grey tea-infused gin, lemon juice. 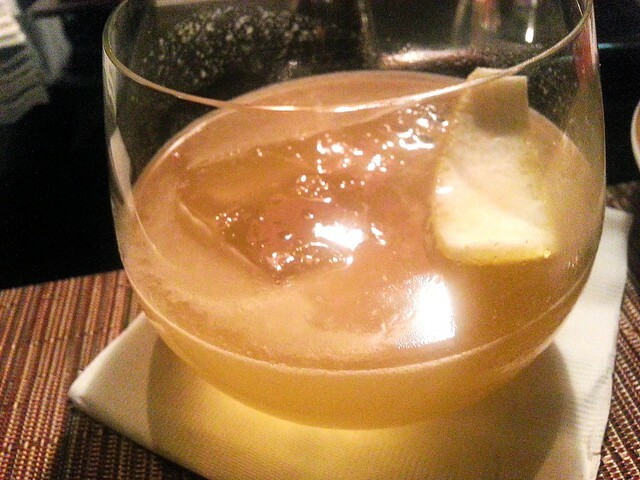 Samurai Sword: Yamazaki 12 Year Single Malt, honey syrup, ginger, lemon juice. Don’t see anything you like off the 15-drink list? 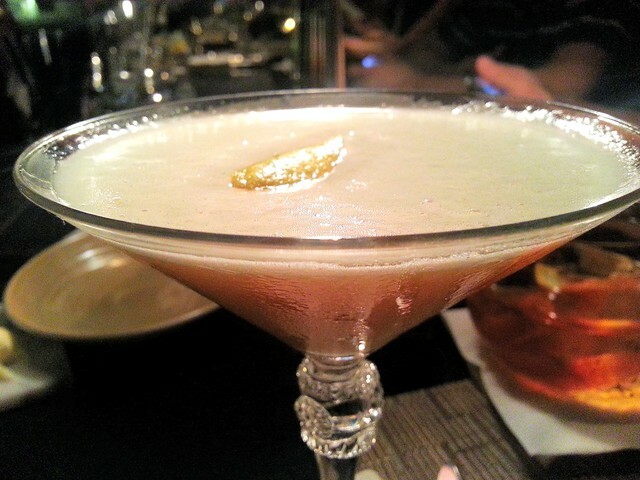 The bartenders will gladly make you anything you desire. I should have ordered up a Hudson Whiskey Manhattan but was saving myself for a trip to £10 across the street at the Montage after. Yeah, I was feeling fancy that night with a bonus check burning a hole in my pocket. If you’re the spontaneous (and well-heeled) sort who doesn’t like making dinner reservations, the bar, located just off the front entrance, has actual lounge seating which replaces the not-cushy, wooden chairs from before and better accommodates casual dining. So either grab a plush seat along the wall of glass patio doors or claim a bar stool which gives you a better view of the patio (apparently where Christina Aguilera was holding court when we were there) as well as a clear line of sight into the dining room and kitchen in the way back. You can order bites off the menu and see the comings and goings of restaurant patrons, with the occasional celebrity popping in because, you know, it’s Spago.